An intriguing mix of poets, Frank, but as you say skewed towards the States. I recognise most of the ones you list. I still find Marianne Moore a bit of a test. But what about Walt Whitman – nowhere to be seen (unless I read too fast)! And Dylan Thomas (one of at least three Thomases, as you noted). He died in the States – what more could he do to get noticed over there? There are others missing that are on my list, though maybe not part of a canon. Ted Hughes – he’s got an American connection as well. Seamus Heany, Philip Larkin and an outsider in terms of the UK/US – Derek Walcott. I could specify my favourite poems but it’d take too much time to decide which is my most favourite for each poet. Many thanks for stopping by my blog and commenting. Much appreciated. I’ll keep coming back to yours – how could I resist so much reflection about poetry! Yes, I had the same first thought: “Why isn’t Walt Whitman on upper parts of the list” but Emily Temple in the article helpfully lists the anthologies she poured over to tabulate the list. Eight of them had “modern” or “contemporary” or the like in their titles. Whitman wrote roughly at the same time as Dickinson, and both of them have gotten their propers as the founders of modern American poetry, but Dickinson was first published a half a century later in 1890, a few years after her death. 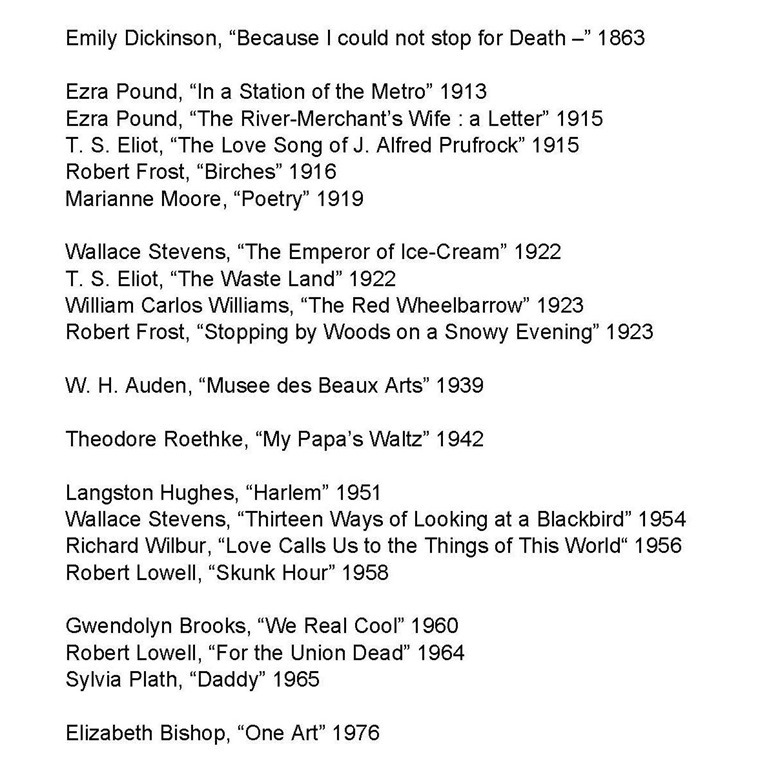 This seriously skews the list to the moderns, but with American poetry this is not a huge issue. Americans were writing competent poetry in imitation of English poetry from colonial times, but wasn’t until the New England Fireside Poets a couple of decades before Whitman and Dickinson that original American styles even began to develop–or at least it seems that way from what reading I’ve done. There’s no American Blake, or Keats, or Wordsworth equivalent in originality contemporary to those Englishmen, or if there was, I’ve never found them. Which brings me to the more unfortunate point. Half the anthologies Temple obtained to create her list say “American” on the cover. This more or less eliminates those in the UK and other English speakers. Yes, Auden got in, but as every fan knows, the US side traded T. S. Eliot for W. H. Auden in the blockbuster trade of the 20th Century (grin). With the Parlando Project here, I use plenty of British Isles poets! My main problem is the copyright laws which constrain me from publicly sharing any pieces using words from after 1923. Of those you mention, I’ve done performances of Heany, Hughes, and Dylan Thomas. Larkin or Walcott would fit right in. My favorite pieces that must remain private use words by Margaret Atwood and Auden, and alas I’ll be long dead before I could share them. Somehow when looking at these poem’s publication dates I got the date of Wallace Steven’s “Thirteen Ways of Looking at a Blackbird” wrong. It was not first published in the 50s. It apparently had a publication as early as 1917 and was in his wonderful “Harmonium” collection of 1923.